A great introduction to a range of collagraph printmaking techniques; we spend the morning making plates using an interesting variety of self-adhesive materials and working into the plates with various tools. The afternoon is spent printing the plates in different ways using an etching press. 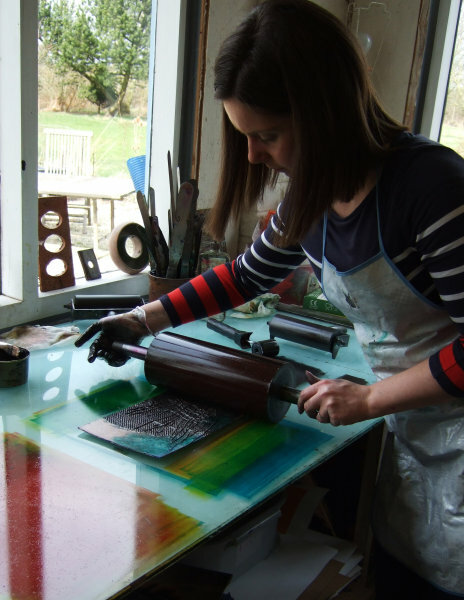 By the end of the day you will be confident to continue making your own printing plates using everyday materials and familiar with different ways of inking up and printing your collagraph plates. Everyone makes several plates and a series of prints to take home. Suitable for beginners or those with some experience of printmaking. "Thank you very much indeed for a fantastic workshop today. Extremely well organised, richly resourced, and relaxed, creative and fun. This was the first time I'd ever been to an art workshop, and any other I go to will have a lot to live up to!" if you would like to use it for non-profit or educational use please credit the source.